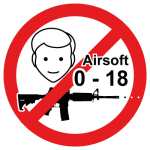 If you are a non-german speaker and want to attend some airsoft events and play with our team feel free to contact us. We will also translate the organisation instructions of german events for our participating foreign language players and communicate in english only in our team. Attend Large Events, DE, Borderwar etc.